Recent European elections are rattling the financial markets and fraying investors' nerves. In France, incumbent Nicolas Sarkozy, whom the BBC referred to as "veteran conservative politician" lost to a Socialist Party candidate, Francois Hollande. Meanwhile, Greek elections raised the uncertainty of future austerity measures gaining enough support. If you've been paying attention to global economic and political events in recent years, these facts should have you worried. The European Union (EU) has been a mess and numerous countries in the EU have had to struggle getting some sensible austerity measures passed. As a Socialist Party candidate in France, Hollande took positions during the campaign which were counter to recent EU debt reduction agreements. For example, Hollande stated that he intends to rollback some of the pension reforms. Sarkozy had championed raising the retirement age to 62 so Hollande said he would move it back to 60. A simple review of the French economy just before the recent election illustrates good reason why voters who cared about the economy were none too excited to re-elect Sarkozy. Before the financial crisis hit in 2008, France's unemployment rate was a relatively high 7.5 percent and then it surged to 10 percent during the severe recession. It declined gradually to 9.5 percent by early 2011 but was back to 10 percent as of the March, 2012 reporting. GDP growth was anemic the past two years, coming in at 1.4 percent and 1.7 percent for 2010 and 2011, respectively. As for stock prices, France's CAC 40, which is their major stock index, is down nearly 50 percent over the past five years and has given back most of its meager rally from its early 2009 lows (see graph below). 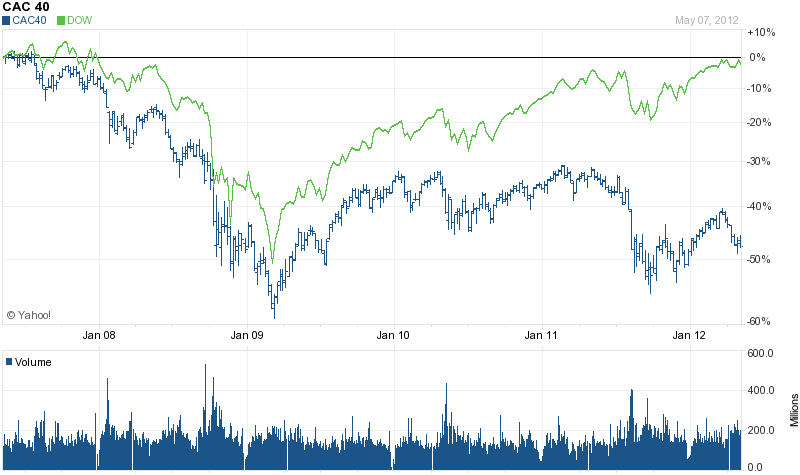 The Dow Jones Industrial Average, by contrast, is at nearly the same level it was five years ago. Now, let's talk economic policy. The BBC referred to Sarkozy as a "conservative" and I can assure you that he is not a conservative. Take a look at the WSJ graphic below which highlights major economic policy positions of the two French candidates. This shows that Sarkozy supported instituting a minimum tax on larger companies and going along with an increase in the value-added tax (VAT) in the fall of this year. Regarding economic policy, Sarkozy appears to be as liberal or even more liberal than President Obama and not significantly different in terms of stated policies than the Socialist Hollande! Investors wringing their hands over the election of a Socialist as French President should calm down. Sarkozy lost re-election because the economy continued to do poorly under his five-year term even once the recession had passed. And, his economic policies weren't demonstrably different from Hollande's. Also keep in mind as I've pointed out with the various branches of the U.S. federal government, who is President is but one of numerous factors determining the direction of a country's economic policies. Now, I'm not suggesting that the election of Hollande is a good thing for France's economy or that this won't cause some rockier negotiations within the EU in the future. I don't think Hollande's election will be good for the trajectory of the French economy or for future EU debt negotiations. But, life will go on and the French political parties will have a chance again in five years to put up better candidates.